You get can get email notifications of new topics in forums. You only get one email per forum, when the first new topic appears. You only get one email per forum, no matter how many new topics have appeared since. When you click in the link in that first email to visit the forum and view all new topics, the notification system resets and begins watching for new topics in that forum again. 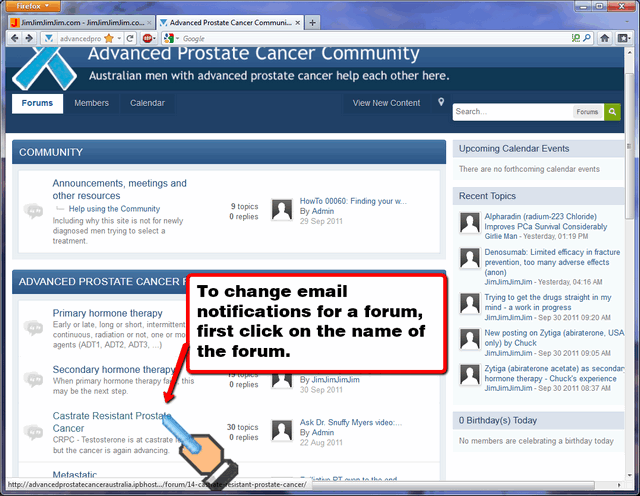 Asking to be notified by email of new topics in a forum is called following a forum. You may already be following all forums (because a Community volunteer has done it for you). If you see a button that says "Follow this forum", skip the next two steps. 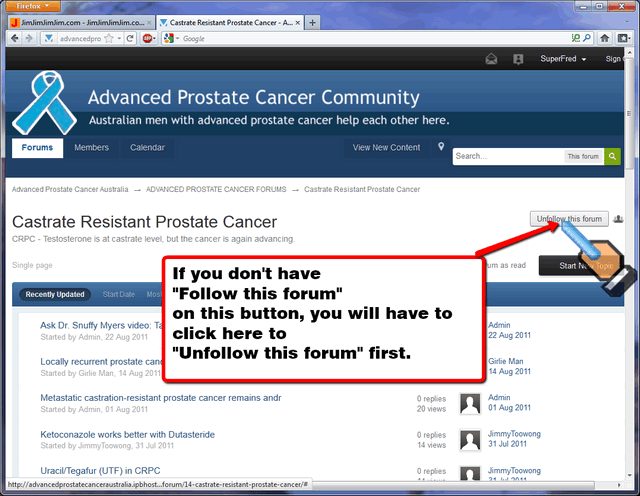 If you are already following the forum, the button will have "Unfollow this forum" on it. You may already be following the forum (because a Community volunteer has done it for you), so just leave it alone. 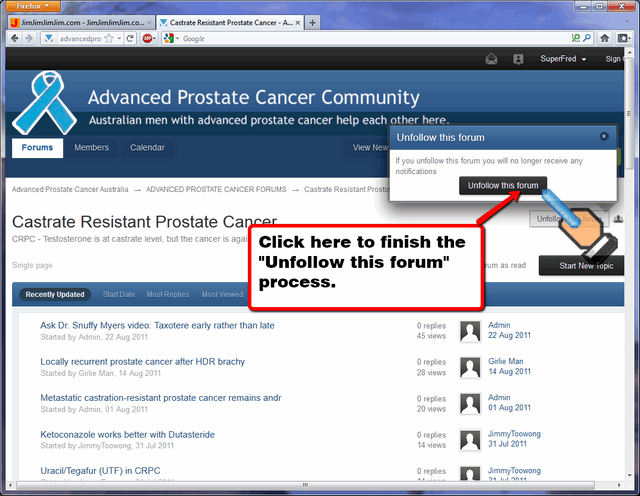 Click the "Unfollow this forum" button to clear existing notifications for that forum. Click the "Follow this forum" button. Put a tick in the check box in front of Receive notification. 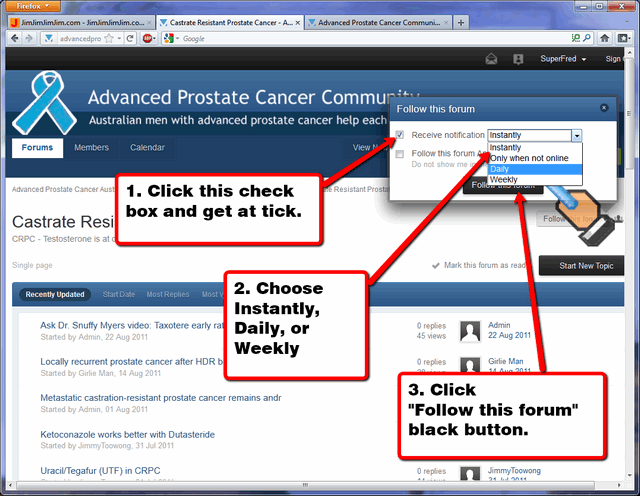 Click the black Follow this forum button to finish. 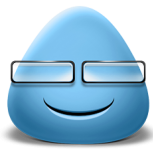 Q: Can you just send me one email digest for all the forums? A: Not technically possible at the moment. Q: Do I have to follow all forums? I am only really interested in two or three. Some of our men are not very familiar with computers, and may post in an unexpected forum. Some of our men are not very familiar with the disease, and may post in an unexpected forum. 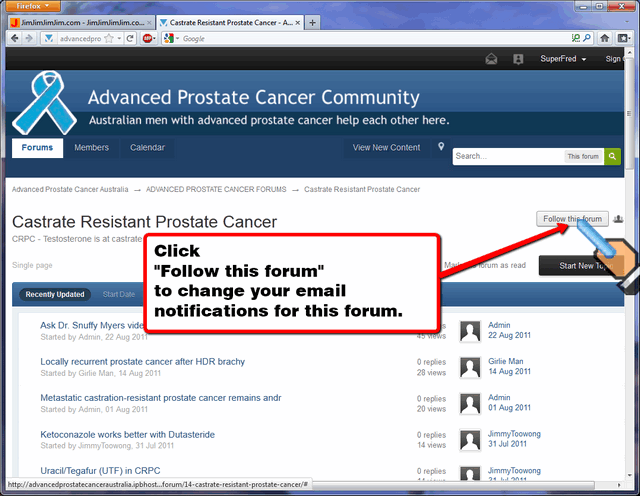 Some topics may belong to several forums: Metastatic disease may be castrate resistant or not. Fred talking about a new agent for castrate resistant, metastatic prostate cancer may choose New agents, Castrate Resistant Prostate Cancer, Metastatic, or perhaps My story or Any suggestions. A report on a new video or newsletter may cover many topics. Q: I am not used to so much email. At least 9 out of 10 topics are of no interest to me, or too technical for me. Is there any cure? A: Welcome to the world of online information! It is not like picking fruit where you can easily see what you want. It is more like gold mining where you have to pick through tons of dross for a few valuable nuggets.